I had two major redesigns in mind: make the parts smaller, and make them 'better'. Making the parts smaller was simple: choose something with the same values, but in a surface mount package, instead of through hole package. This means that instead of putting the part through a hole and soldering it into place, you put the part on the surface, and solder it into place via its pad. Making the parts 'better' was also simple enough: choose more powerful LEDs, and collapse the transistors. The reference design used a whopping 5 transistors. One was used to power the other four, which were used to power their respective LED. My design replaced this system with a single FET. A FET is a Field Effect Transistor, which fires based on the field of electricity, not the flow of it. This means that you may lose an electron or two every second. Incredibly efficient. It can also handle a very high throughput of power: enough to power two nice LEDs. 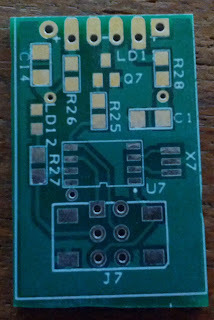 After choosing all the parts (I'll detail these later), I had to design the solder pads for each part. This means going through the spec sheets for all of them, and finding where the pins are located, so I can design a PCB that will route all the parts together. It turns out there exists a standard package size for resistors and similar parts. The 0805 package allowed me to place five identical pads: four resistors, and one LED. Eventually I chose the parts around the package, allowing me to make a more mainstream design where I could choose cheaper, more common parts because I chose a popular package. I had to start connecting all the parts then, in a meaningful manner. 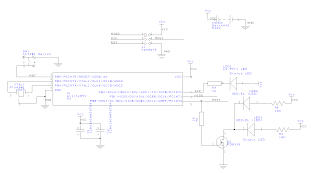 This process begins with creating a schematic, and ends in the routed PCB (Printed Circuit Board). The schematic is simple enough: make the schematic symbol for every part, and connect them in the order they should be connected. Here's a picture of what it ended up looking like. Next I had to work on designing the actual boards. 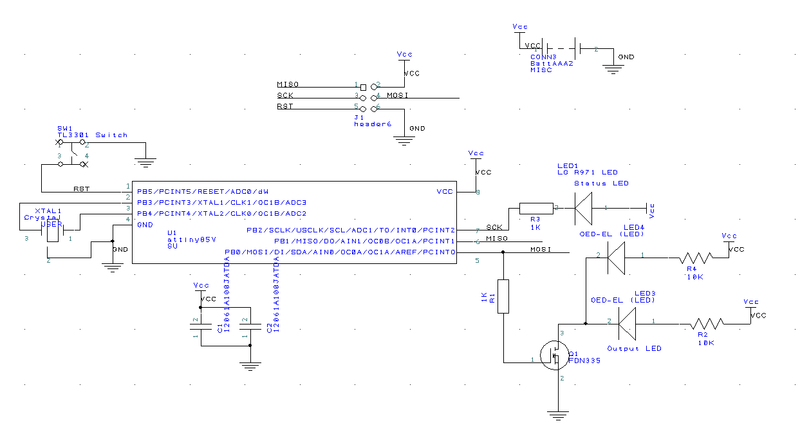 This isn't the easiest thing in the world: the program I used to design it (PCB Artist) is a piece of crap. I chose it because they offer a deal where I get five sheets of 60 square inches of PCB for around $135. If I just wanted one unit it would have cost me close to $75, so it was a no-brainer kind of a choice. When you're dealing with 'actual' engineering stuff I guess the price breaks are pretty extreme. Regardless, routing the PCB means that you're given the pads you dimensioned earlier, and, using the connections you noted in the schematic, you dictate where the metal traces will go. 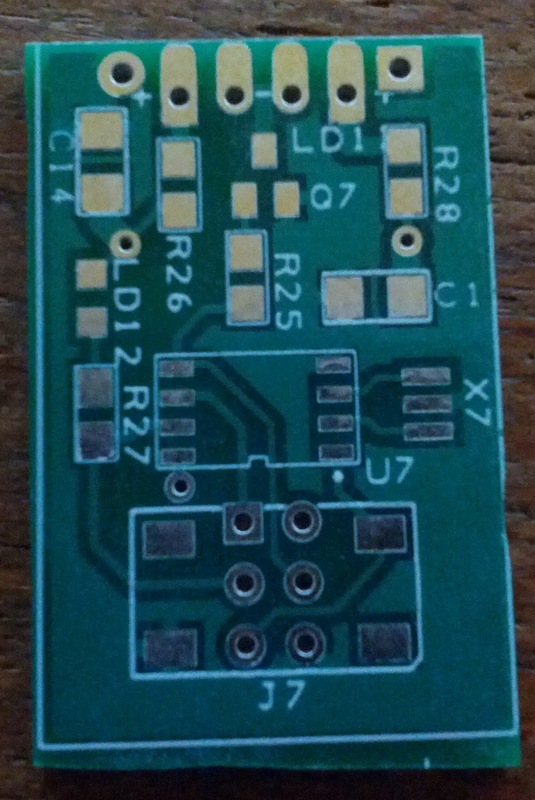 Since it's such a simple board, there's only two routable layers: top and bottom. 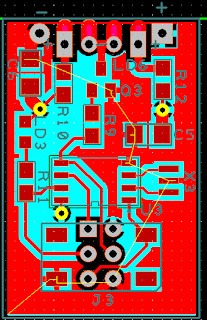 To make life easier it's tradition to 'flood' the top of the board with ground, and the bottom with VCC (power). This makes it vastly easier to give parts the power they need. If a part needs power, you route it to a via, which connects to the other side of the board to give it power. The end product looked like this. The brighter red is either a trace, or part of the board flooded with ground. The dark(er) red represents the pads to which the parts will be soldered. The cyan is seen where nothing is traced on the top layer, so it shows the bottom layer--cyan is power. The yellow circles are vias, connecting the two layers. Finally, the thin yellow lines are lines that say "dude, you should totally connect these parts, otherwise it won't work". The program was buggy, and I promise you the final product works. After uploading the part file, I received the final product in a week or so. I assumed it would be a chinese-type operation to save money, but it actually is based out of Boulder, Colorado. Also, out of nowhere, they sent me a bag of "Butter Lover's" popcorn, along with the five sheets of boards. To optimize my return on investment, I laid out 50 units per sheet, giving me 250 boards for the price of 5. 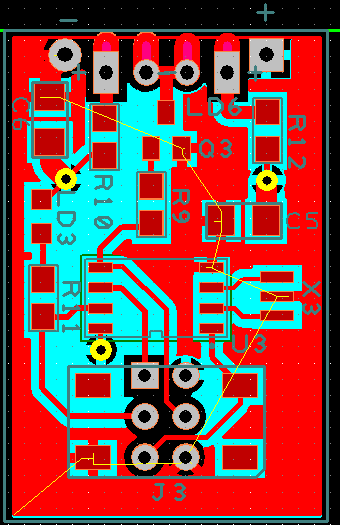 In the end, it looks like a regular PCB, and functions as it should, withhold one problem: I accidentally reversed the flooded polarity. The top really is ground, and the bottom is power, but double check your battery back before putting the batteries in. I broke one unit by putting the batteries in regularly. For the second batch, I bought battery packs with wires instead of metal leads. This way I could cross the (insulated) wires and connect everything as it should. For my highschool senior project I decided to redesign the TV-B-Gone, using Ladyada's model as a reference (http://www.ladyada.net/make/tvbgone/index.html). The reference model was great, and still continues to function after two years. The problem was that it's too big. It's got a healthy nice heavy feel to it, but it's too large and fragile for the purpose it serves. Before I critique the design too much, I should note it's designed to be large so that it's easy for beginners to solder together. Because it's supposed to be easy to solder, nearly every part is through-hole. Easy to solder, but huge and fragile. After putting it in my pocket a few times, a couple of the transistors broke off, rendering the outer two LEDs useless. But I liked the idea, so I took on the challenge of redesigning it. Originally I hoped to have three designs: wide short range, narrow long range, and a combination. Each was to be powered by a coin cell or two, making the entire unit the size of your thumbnail. Unfortunately, while coin cells can deliver the required voltage they don't come even close to delivering the required amperage. Back to regular cells, and ultimately I settled on downsizing to two 'AAA' cells.